What happens when your school budget won’t allow for enough dissection specimen for your class, or you have a student who refuses to participate in dissection for personal or religious reasons? What do you do when a student misses an entire week of school, and it just happens to be the week of dissection? What if you homeschool your child and want to give them an authentic experience without having to break the bank on purchasing dissection supplies or finding a program that offers lab experiences? WHY SHOULD YOU USE PAPER SCIENSTRUCTABLE 3D DISSECTION MODELS? They’re mess free. One of the biggest concerns about dissection is clean-up and disposal. Each year, we DREADED the end of dissection – mainly because we would find bits and pieces of specimen throughout our classrooms, the hallway, and all over the school. There was always that one student who thought it was hysterical to throw organs at other students or pretend to eat them. 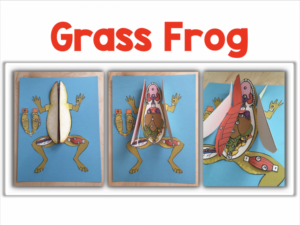 And while we always tried to include truly authentic dissection explorations in our lessons, we often times used only the models to teach about the worm or the frog. It was nice to stop worrying about chemical smells, biohazard disposal, organs flying into eyes and hair, or the possibility of squeamish students losing their lunch. 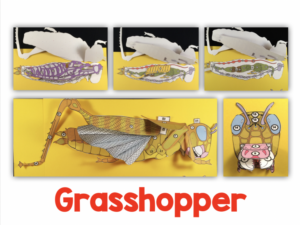 Our paper models mimic the real thing, right down to the way the organisms are dissected, so our kiddos got an authentic, hands-on experience without the mess. They’re great for small budgets. As we mentioned before, our paper Scienstructable 3D Dissection Models are life-saver for small classroom budgets and homeschool parents. For the cost of a single-user license and a few sheets of paper per model, you can have a lifetime of dissections for your kiddos. When we create these, we try to conserve paper as much as possible, so each model template takes anywhere from 1-5 pages to print – WAAAAY less than the cost of purchasing dissection specimen, gloves, replacement scalpel blades, and other materials each year. If you print the readings as a class or group set and laminate them, you’re all set for years to come! They’re eco-friendly. If you’re concerned about the effect the preserving chemicals such as formalin, phenol, methanol, and glycerin have on you and your students’ health, or you’re worried about disposal of your specimen and the impact on our environment, then you’ll appreciate paper models even more. They are chemical free and fully recyclable once a student has finished the lesson. The only smell that may emanate from your room is the scent of rubber cement and glue sticks, and a little sweat from all that cutting! They’re anatomically correct and aligned with one another. To provide a truly authentic comparative anatomy and dissection experience, one that mimics a true exploration, we designed each model to be as anatomically correct as possible and each exploration to follow a real dissection process, down to how the model opens and how the organs and organ system are layered within the organism. We keep the colors of organs and organs systems consistent between the models so that students can really SEE the relationships among the organisms and structures. For example, all of the nervous tissue within our models is colored grey, so whether they’re completing an earthworm, grass frog, or fetal pig, students are able to identify those connections in anatomy between each organism. They solidify understanding of anatomy concepts. Whether they are used as an alternative to real dissection, as a pre-dissection study tool, or as a summative assessment during comparative anatomy studies, our models truly helped our students to understand how organs work with another to create a functioning organism. While we’re always big fans of jumping right into doing the real thing, it’s not always feasible. We’ve often used our paper models as a pre-dissection tool to ensure students are throughly prepared for the dissection process in lab. We discovered that incorporating these models reduces confusion about how dissect, solidified understanding, and provided a take home tool to study for their lab practical. Students who chose not to participate in the actual dissection also received an authentic experience that allowed them to be assessed in the same way as their peers. As mentioned before, we found that introducing the models prior to or inline of dissection actually increased overall understanding which translated into higher test scores in class and on their EOCTs. They are great for interactive notebooks. One thing that we kept in mind when making our models is that we wanted a place for students to keep all of their work. Each model is made to fit into an INB or spiral notebook. This allowed students to carry their models with them without losing specimen pieces or information about organs and their functions and also made them more accountable for reviewing the structures before their practical. alternative to actual dissection – think conscientious objectors, absent students, budget/time constraints, etc. 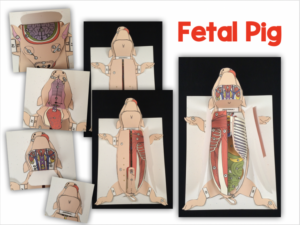 We designed our paper models to be a one-stop shop for our dissection explorations, so to that end, each one includes an animated PowerPoint presentation with embedded color keys, assembly instructions and the organ function answers. We also wrote our own detailed and accurate student-friendly reading for each model that covers all of the most observable organs in the organism – students read over the information and locate the structures and their functions and then populate their key with the correct answers. The numbers on their key align with the color-by-number model template. 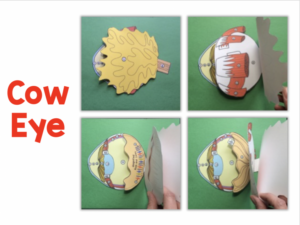 We recently differentiated ourScienstructable 3D Dissection Model templates to create opportunities for success for those students with executive functioning deficits by providing both blackline and color versions of our models. Once complete with their keys and cutting out their organism, students assemble their model using the instructions provided and start exploring! We extend the lesson even further by adding several extension questions that might ask things such as the need for surface area in certain organs, or how the organs they observed related to various other organisms, or to fill in a table describing anatomical direction terminology. We honestly love these so much, we CAN’T STOP CREATING THEM. We began our journey with the frog, but we’ve branched out so much over the years. Between our dissection experiences throughout our careers, we’ve compiled a list of what we feel are the most important organisms to explore for comparative anatomy, including varying levels of the vertebrate and the invertebrate classes. We’ve created eight models over the last ten years and plan on adding seven more before the end of Spring 2017. Once we’re done with these, we’ll be moving on to individual organs and other concepts… we have so many ideas! Anyhow, maybe you can find one to add to your comparative anatomy lessons! Included in this Pig Scienstructable 3D Dissection Models are a 25 slide PowerPoint presentations complete with bellwork, objectives, instructions, and answer keys to the organ table, the student-friendly reading that provides everything students need to know about the fetal pig, it’s organs and their functions, and both the blackline and color versions of the color-by-number 3-d model showing the location of each of the 111 structures of the fetal pig. Included in the Frog Scienstructable 3D Dissection Models are a 14 slide PowerPoint presentations complete with bellwork, objectives, instructions, and answer keys to the organ table, the student-friendly reading that provides everything students need to know about the frog, it’s organs and their functions, and both the blackline and color versions of the color-by-number 3-d model showing the location of each of the 38 structures of the frog. Included in the Worm Scienstructable 3D Dissection Models is a 10 slide PowerPoint presentations complete with bellwork, objectives, instructions, and answer keys to the organ table, the student-friendly reading that provides everything students need to know about the earthworm, it’s organs and their functions, and both the blackline and color versions of the color-by-number 3-d model showing the location of each of the 14 structures of the worm. Included in the Eye Scienstructable 3D Dissection Models is a 10 slide PowerPoint presentations complete with bellwork, objectives, instructions, and answer keys to the organ table, the student-friendly reading that provides everything students need to know about the eye, it’s organs and their functions, and both the blackline and color versions of the color-by-number 3-d model showing the location of each of the 19 structures of the eye. Included in the Grasshopper Scienstructable 3D Dissection Models is a 22 slide PowerPoint presentations complete with bellwork, objectives, instructions, and answer keys to the organ table, the student-friendly reading that provides everything students need to know about the grasshopper, it’s organs and their functions, and both the blackline and color versions of the color-by-number 3-d model showing the location of each of the 60 structures of the grasshopper. 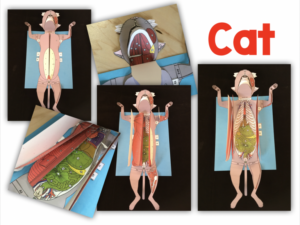 Included in the Cat Scienstructable 3D Dissection Models is a 36 slide PowerPoint presentations complete with bellwork, objectives, instructions, and answer keys to the organ table, the student-friendly reading and keys of over 40 pages that provides everything students need to know about the cat, it’s organs and their functions, and both the blackline and color versions of the color-by-number 3-d model showing the location of each of the over 200 structures of the cat. We’re just getting started! We have THIRTEEN models in all, with 4 more in production and 10 more on the creation table. Stop by our store to view all of ourScienstructable 3D Dissection Models! in addition to the ones listed above, we have a starfish, shark, crayfish, clam, sponge, rat and squid. VERTEBRATE ANIMALS SCIENSTRUCTABLE 3D DISSECTION MODELS which will eventually include the pig, frog, cat, shark, perch, rat, bird, and snake when the bundle is COMPLETE IN LATE SPRING OF 2018. **Organisms that are in bold are already completed and added to the bundle. AQUATIC ANIMALS SCIENSTRUCTABLE 3D DISSECTION MODEL BUNDLE which will eventually include the crayfish, starfish, squid, sponge, clam, shark, perch, bird, frog, turtle and snake when the bundle is COMPLETE IN LATE SPRING OF 2018. **Organisms that are in bold are already completed and added to the bundle. Any way you slice it, our dissection models are top-notch! Head over to our store and check them out! These are awesome and just what we were looking for! Thanks so much! We will be ordering soon. I’m very interested in your eye dissection kit, however I teach French immersion. Is there a way to get an editable version? Do you have any plans for making a rat? We dissect rats at our school and I’m looking for an alternate assignment for those students with objections or sensitivities. Any chance you are done with the snake paper dissection? My veterinarian science class at our homeschool co-op really enjoyed the cat dissection this past fall. This Friday we are studying reptiles and I would so love to present them with your paper snake dissection model! We are finishing up the perch this week and working on the snake next. It will probably be a few weeks before it is done though.. stay tuned! Hi there, I am excited!!! This 3-D structable dissection sounds perfect. 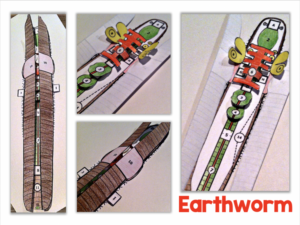 I am going to make a purchase of the cow eye and earth worm. Thank you so much!! !